Can Primo save the galaxy AND his family? He’s going to try!!! Rocket Salvage starts at a dead run and never slows down its frenetic pace. As the story races by, flashbacks interweave to build each character’s background, so the non-stop action has its motivations revealed along the course. Primo Rocket was the fastest man in the galaxy, now he runs a spaceship salvage yard, keeping his little family together. He’s a single parent, and not the greatest, to his clone, Beta, and his daughter, Zeta. When old friends resurface and forces that divide the galaxy gather to find a lost ultimate weapon, trouble points its way to Primo’s door. At the beginning of the novel, each character has their own flavor: Primo is macho, Beta is challenged in the IQ arena, and Zeta seems to be a brat. Over the course of the novel, each of those family members grows significantly as an individual even as they tighten their bonds as a family. Throw in the odd girlfriend for Primo, a father figure for Primo who is also a mother figure for Zeta, and a backstory as a harvested and abandoned clone for Beta, a mad scientist, a galaxy torn by two factions, monsters and robots, and there’s a whole lot more depth than you’d envision for this story when you first start reading. There’s a lot about family, friendship, loyalty, and what it really means to be a monster. 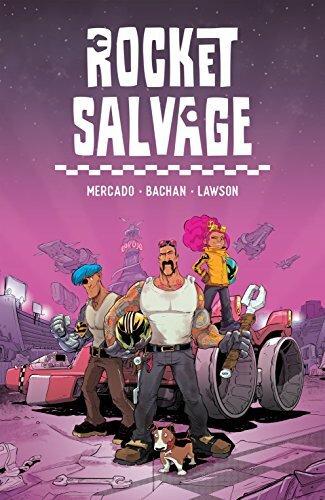 Rocket Salvage is a colorful quirky comic greater than the sum of its parts, which seems aimed at middle schoolers. I hesitate to call it a graphic novel, as it is far less dark and graphic than the graphic novels I’ve read before, but those were also for adults. The illustrations are very, very nicely done, the range of alien beings is phenomenal, and overall, I think it’s well-designed and beautifully colored novel. The story is self-contained and has enough background that it can stand alone, and yet that background hints at events big enough that I hope they generate their own graphic novels. Highly recommended for the depth of the story, the beauty of the entire package, and just for sheer fun. Primo Rocket is a down-on-his-luck rocket racer, with two “kids” (one turns out to be his clone, another turns out to be . . . well that would give too much away) who finds himself mixed up in an intergalactic search for a rumored “ultimate weapon.” Backwater gangsters, mad scientists, and two antagonistic governments end up in an epic showdown, and it turns out it’s Primo’s job to save the world.